Syracuse forward Marek Dolezaj celebrates a dunk. Mandatory Photo Credit: Kicia Sears, The Juice Online. Buddy Boeheim: Boeheim starts the season on a roll and with the exception of one game here and there emerges as one of the ACC’s best shooters. He averages over 12 points a game, establishing himself as the third offensive option. John Bol Ajak: Ajak shows the most promise of any raw big man Syracuse has had in recent history, and is able to give SU 10 solid minutes a game. His offensive game is surprisingly competent, and he’s able to hit a few 10-foot jumper to keep defenses honest. Robert Braswell: Braswell packs on 15 pounds of muscle over the summer while continuing to refine his outside shot. He provides 15 minutes a game at wing, and becomes an effective help-side shotblocker. Oshae Brissett: Brissett gets back to his roots, and remembers that he is a high-energy rebounder that does the majority of his damage inside the paint. He stops settling for long jumpers and 3-pointers, only shooting them when completely uncontested. Jalen Carey: Carey’s ball handling improves tremendously over the summer and he plays more than 30 minutes a game as SU’s point guard. Carey uses his quick first step to set up his teammates for open looks and becomes a nightmare for opponents at the top of the zone, averaging over two steals per game. Marek Dolezaj: Dolezaj packs on 15 pounds of muscle (see Braswell) and has the ability to play 10 minutes of center and 20 minutes at wing per game. He becomes emboldened in his offensive game, and stuffs the stat sheet with an average of 9.4 points, 5.6 rebounds, 2.3 assists, 1.2 blocks and 1.0 steals per game. Joe Girard: Girard quickly shakes the label that he averaged more than 50 ppg in high school against “weaker” competition, and proves he can play with the stronger, quicker players in the ACC right away. 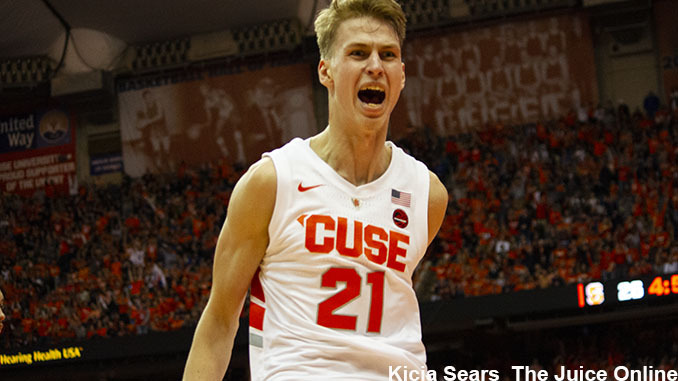 He has a freshman campaign similar to Boeheim’s, and shoots over 30 percent from downtown for the year. Brycen Goodine: Goodine adjusts quickly to the college level, providing quality backup minutes at guard. The high flyer oohs-and-ahhs the Carrier Dome crowd on breakaway dunks while shooting a respectable 30 percent from beyond the arc. Quincy Guerrier: The Canadian fills the other wing spot in the starting lineup and turns out to be a one-and-done player for the Orange. He finishes second on the team in scoring behind Hughes, and effortlessly swallows rebounds on the defensive end. Elijah Hughes: Hughes adds another dimension to his game, a dribble drive that gets him easy mid-range looks. He becomes Syracuse’s leading scorer at over 16 points per game while starting at shooting guard. Bourama Sidibe: Sidibe stays healthy and is able to lock down the back line for 25 minutes per game. He develops a jump hook inside which makes him an offensive threat, and blocks 1.8 shots per game. Howard Washington: Washington, the only pure point guard on the team, becomes a perfect change of pace guard for Carey, and is able to finally provide meaningful minutes for the Orange in his third year on campus.